Intelligent Forms - DealManager - Wizdocs, Inc. Attorneys start by selecting a diligence capture form. Based on the selected form, DealManager presents the reviewer with questions and training materials based on the type of document being reviewed. DealManager comes preinstalled with popular capture forms to get your practice started. Customize these forms or design new forms using the Wizdocs Forms Designer. Our structured forms guide attorneys through the review process, step by step. Guided prompts, cascading selection boxes, and linked data fields make it easy for an attorney to enter their diligence results. 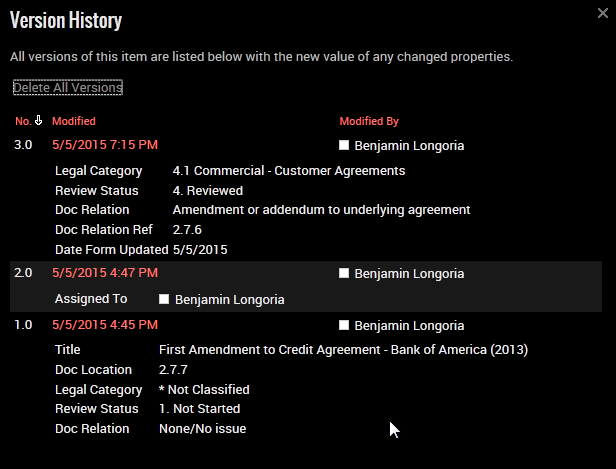 LegalTags make it easy for attorney to tag documents or tasks with "red flag" issues, saving them hours of time vs. manual entry. 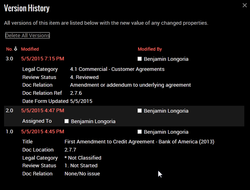 Each flagged issue is associated with a section reference to the underlying document. Workflows may be initiated on each red flag issue allowing attorneys to track their resolution. DealManager makes it easy to create a subtask for a specialist or other deal team member. DealManager emails the specialist and provides a link to a response form where the specialist may enter their answer and optionally attach one or more documents. Messages are tracked through DealManager. Automatic version control tracks changes to the diligence analysis on a per field basis. Supervisors may track what was changed including who made the change and at what time. Reviewers may place alerts on their diligence analysis when a supervisor alters entries, allowing users to view corrections made to their entries.